On Sunday evening, when Michael turned on the NBA Playoffs, I went to the kitchen and mixed these up. They looked like an easy weekday breakfast, and let’s face it, I skip breakfast all the time. Or I eat a granola bar during my morning work break and call that a meal. It’s not a meal, though. These are, though! I had way too much fun playing with toppings, because for once in my life I had all kinds of fresh berries in the fridge. The peanut butter ones turned out great, too! I’m planning on adding flaxseed and coconut butter to the next batch. These lasted us 4 days in the fridge, and two of the cups equaled a lot of oatmeal. You can freeze them and then microwave them as needed, so you could make several batches if you want to get stocked up. These taste just like my mom’s baked oatmeal, which I love. The berries burst open in the oven, but remain flavorful and add some health benefits as well as color. When food looks good, you’re much more likely to eat it! There are also tons of substitutes you can use for any ingredients you’re missing, so no excuses now. Have fun playing around with toppings! Pretty much anything goes- macadamia nuts, shredded coconut, sliced bananas, peaches, you name it. They all bake up to perfection and can be stored for a long time! They also keep me full for hours. I eat them just the way they are, but you can also put them in a bowl with some milk, heat in the microwave, and eat it like regular oatmeal. Just make sure you try them out soon. Breakfast is important! 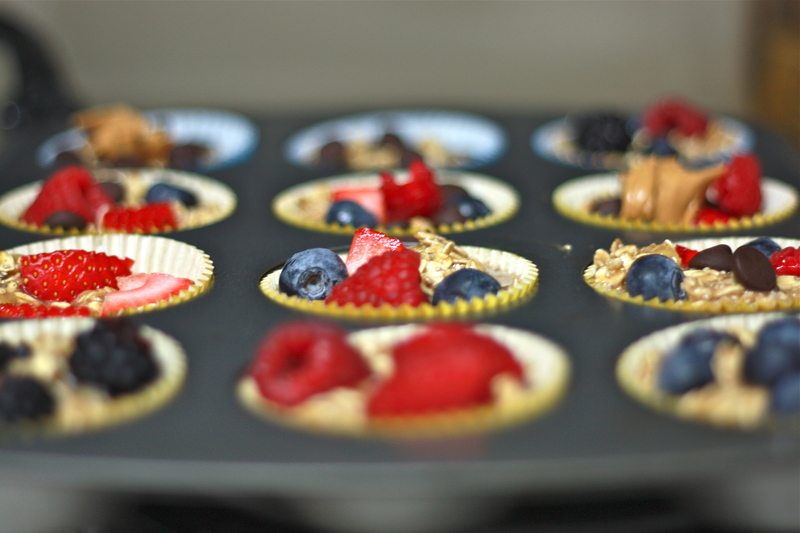 Preheat oven to 350 F. Spray a cupcake pan with nonstick cooking spray or use paper liners. In large mixing bowl, stir egg, vanilla, butter, banana, milk, and maple syrup together. Add brown sugar, oats, chai or flaxseed, cinnamon, and baking powder. Mix well to combine. Divide mixture evenly into pan wells using a 1/4 measuring cup. Add toppings and press gently into batter. Bake 20-25 minutes or until toothpick inserted in middle comes out clean. Let cool in pan for 10-15 minutes before removing to a wire rack to cool completely. Enjoy warm, store in the fridge for 3-4 days, or freeze for up to one month. If frozen, microwave in a bowl or plate for one minute before enjoying.